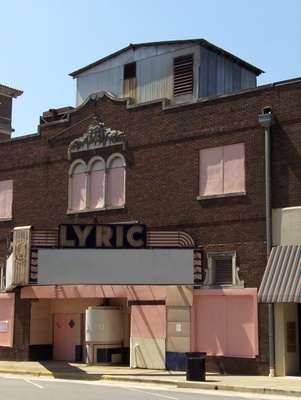 "Lyric Theater, Waycross GA" by George Lansing Taylor Jr. The Lyric Theatre was opened around 1927. It appears to be the work of Valdosta architect Lloyd Greer, although this is not documented. The theatre was operated by Lucas and Jenkins in the 1940’s and 1950’s.A Streamline Moderne style marquee was installed sometime in the 1940’s, featuring a triangular shape with a large “L” at its center and the typical complement of neon lighting. it now lies vacant. Taylor, George Lansing, Jr.; Lance Taylor; Photographers -- Florida --Jacksonville; Photograph collections -- Florida -- Jacksonville; Lyric Theater; Lloyd Greer- architect; Historic district; Ware County (Ga.); Theaters --- Georgia --- Waycross.